The blooming of the green world is intimately tied to the economy, and as the economy recovers new playgrounds are springing up like dandylions! Here’s a Green Spiral Map that shows the many great playgrounds around Saint Louis; send an email to GreenSpiralTours@gmail.com if you’d like an email copy of the map which will let you to zoom in for a better look. Especially if you are involved with a school, it’s extremely important to see “best practices” before designing your new playground; I recommend taking a large group of PTO families and lots of “stunt kids” out on a bonding bus ride together to test out different playgrounds in real life, long before you begin the playground planning process. 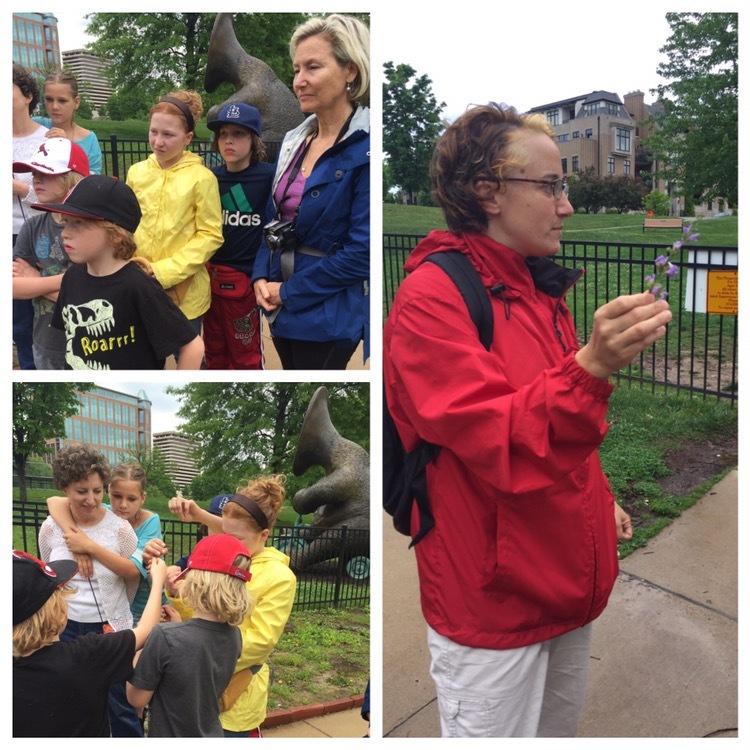 Fortunately we have lots of creative and unique playgrounds in Saint Louis worth visiting, and here I touch on two we have visited through Green Spiral field trips. On the short list of playgrounds, I would include “The Awakening” in Chesterfield, the Walter Ambrose Family Center in Webster, Keysor Elementary in Kirkwood, New City School in the CWE, Maplewood-Richmond Heights Public Schools and Citygarden. Not only do children build their muscles on the playground, they also build their imaginations, and we definitely need lots of kids with powerful imaginations to help solve some of the world’s most vexing problems. We are moving in the right direction when we build thoughtful playscapes for children which include water, nature, sound, community and lots of positive challenge. The criteria for the Green Spiral Great Playground Map includes “first of kind” playgrounds, play for all abilities including wheelchairs, sense of place and uniqueness. Our greatest children’s playground is unquestionably the Citygarden, which was not necessarily created to be a children’s playground per se. Water is life, and an irresistible magnet for children. To Citygarden’s credit, when all those children spontaneously showed up and jumped into the pools, instead of forbidding the children to touch the water, they hired lifeguards, and let the children play. In addition, children are allowed to climb on the art sculptures, which is not only unusual, but positively enlightened. We must offer our best art to our children, as children have big souls to feed, and they feed their souls with their hands, by touching things. 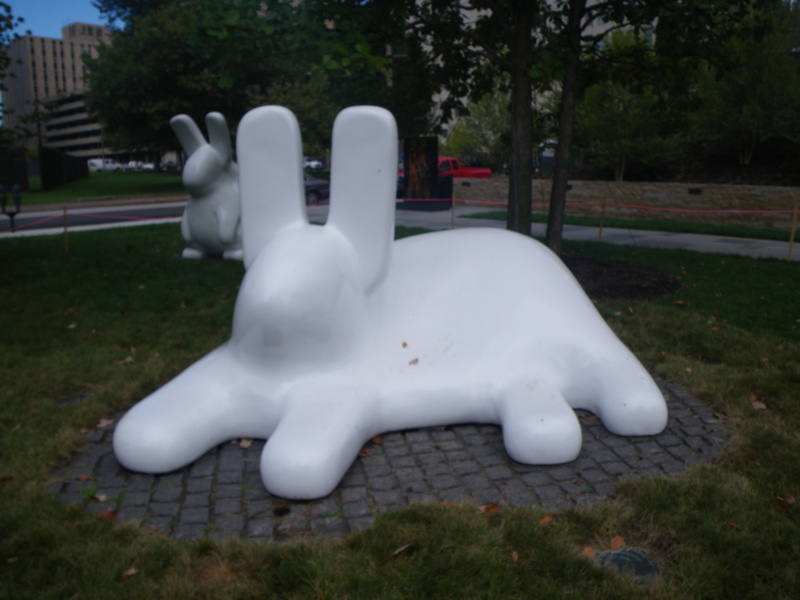 There are numerous areas in the Citygarden specifically designed for younger children, such as the Pinocchio sculpture, the white rabbits, and the hidden musical jump board. Watch while older kids completely ignore the outdoor video screen, preferring instead to hop in the pop-up spray fountains, race about the garden, climb over the sculptures or dip in the pools, proving without question that water is more powerful than screen-time. Richard Louv, author of Last Child in the Woods, writes of the many ways we are systematically separating children from nature, and you may be noticing this disturbing trend that increasingly forbids children to touch, crawl, climb, get dirty or certainly destroy things. 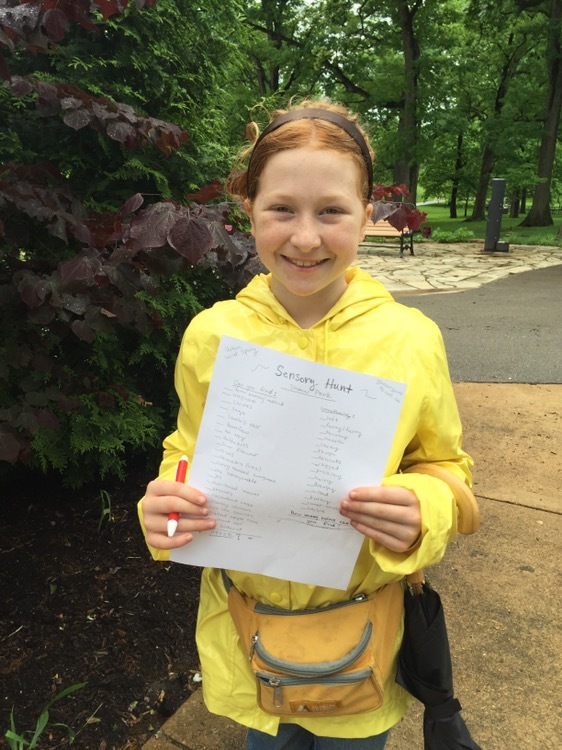 Last Child in the Woods started the recent child/nature movement, and is required reading for anyone serious about creating playground habitats for children. Fortunately for us, through good design and good policy, Citygarden is a “do touch” children’s garden that can withstand the trample of thousands of tiny feet and hands, pointing the way forward in creating playgrounds that include wheels, native plants, creatures, children, dogs, water and a vibrant community life full of all kinds of people. 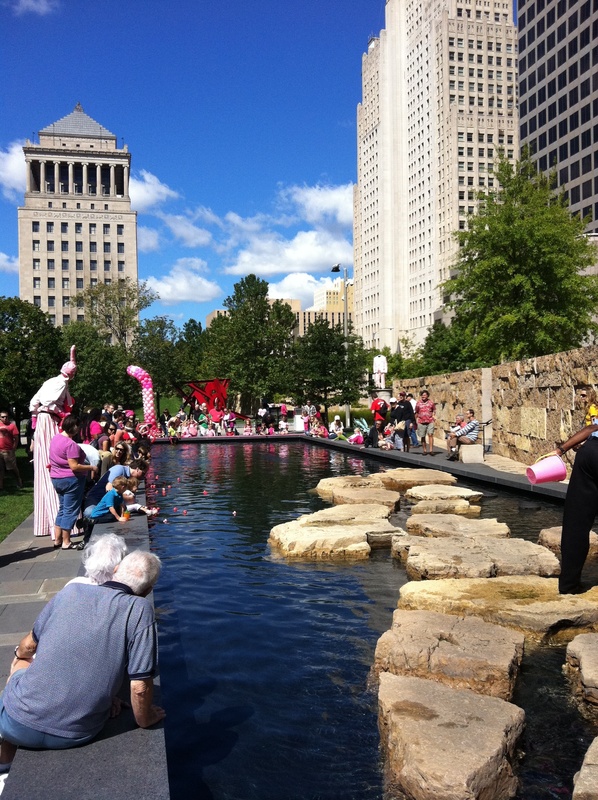 The Pink Ducky Race during the Pink Flamingo Party every year is a particularly nice time to visit the Citygarden, as it’s thrilling for children to watch their special pink ducky float down the length of the pool, and hopefully win the race. The Pink Ducky Race is currently scheduled for September 7th, 2013. There is plenty of available street parking on 10th street near the white rabbits, also conveniently located near the porta-potties. Bring hand sanitizer, and your dog. 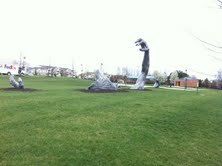 In Spring 2013 Green Spiral hosted a field trip to explore “The Awakening” sculpture by J. Seward Johnson in Chesterfield. Sadly, it was a miserably long cold wet spring and our beautiful April outdoor lunch turned out to be dank, dark, cold and threatening. No one came out to play, and I don’t blame them. “The Awakening” is a gigantic sculpture of a man erupting from the ground; it is truly remarkable when you happen upon it, and photos can’t quite capture the surprise and magnificence that rise up inside you upon approaching it. I recommend you experience it for yourself. What is most remarkable and inspiring about “The Awakening” is Chesterfield’s vision of putting “Art at the Heart of the Parks” and the parks in the center of community. 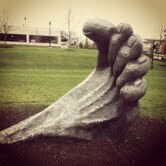 This is a “do touch” climbable sculpture that figuratively and physically puts children, community and art at the heart of the town center. 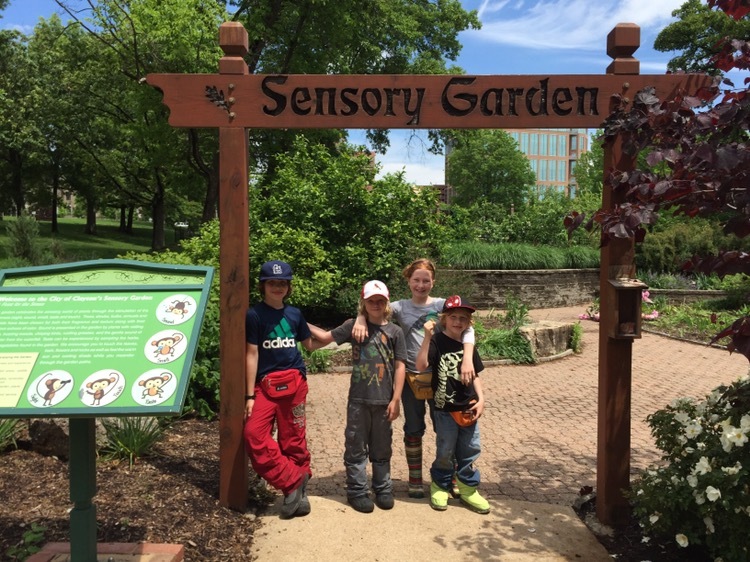 There is pent-up demand for destinations that offer nature play, and Citygarden provides economic proof that groups like Green Spiral and others will venture forth to find these destinations, spreading eco-tourism dollars along the way. 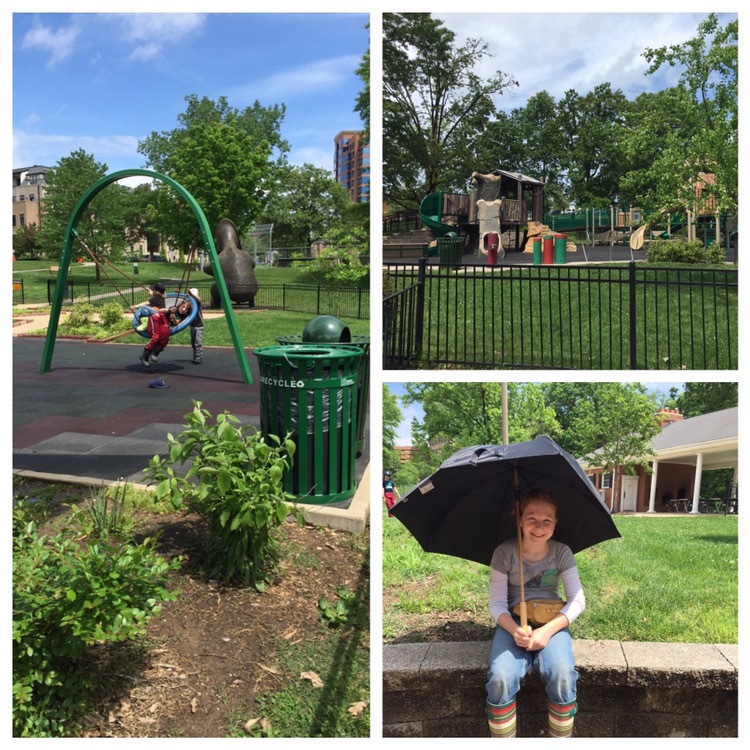 The Chesterfield Mall is conveniently located just east of the playground and sculpture. “The Awakening” sculpture can be hard to find, as it doesn’t yet show up on Google Earth, so I’ve marked it on this Google Green Spiral Playground Map. These two playgrounds, The Citygarden and The Awakening, are unconventional children’s playgrounds by traditional standards, but they serve as anchor points of best practice, as readily evidenced upon your first visit to either one of these remarkable destinations. 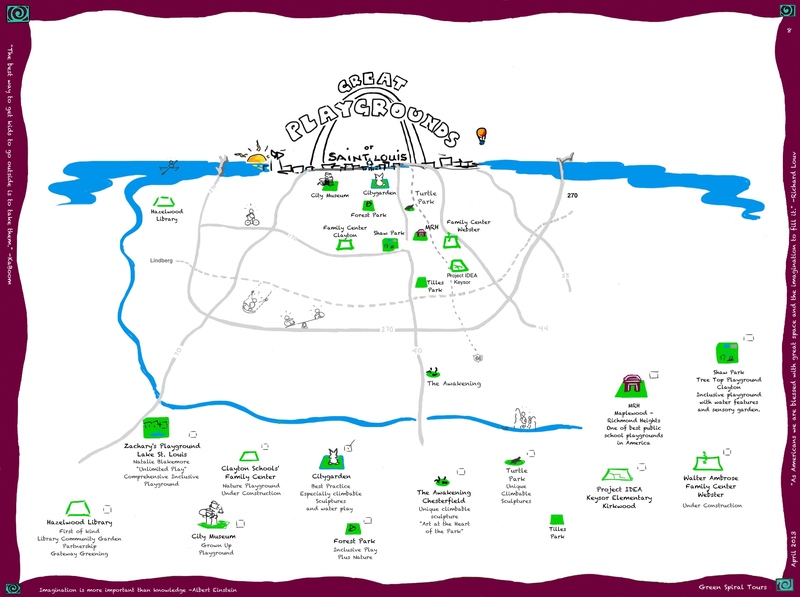 The Green Spiral Map at the top of the page shows a number of other great Saint Louis playgrounds, in existence or under construction, and include Turtle Park, Tilles Park, the Forest Park Inclusion Playground, Zachary’s Playground at Lake Saint Louis, The City Museum, the Tree Top Adventure Playground and Sensory Garden in Shaw Park, New City School, the cutting edge playground at Maplewood Richmond Heights School, the all-abilities, all inclusive school playground at Keysor Elementary School, and the new Walter Ambrose Family Center preschool playground in Webster Groves that spills beautifully down a steep hill. Many more are being added to the map all the time. I encourage you to gather a playgroup and check these playgrounds off your list, use it as a curriculum map for the study of outdoor play; and if you are building a new playground, I’d love to see it on the Green Spiral Map one day! Invite me to talk to your school PTO for free, by sending a note to greenspiraltours@gmail.com, and I’ll come in exchange for selling the maps at $2 each to subsidize the trip.